Cook wouldn't disclose whether Apple will ultimately manufacture a car: 'We're not really saying from a product point of view what we will do." SAN FRANCISCO -- After years toiling away in secret on its car project, Apple CEO Tim Cook has for the first time laid out exactly what the company is up to in the automotive market: It's concentrating on self-driving technology. "We're focusing on autonomous systems," Cook said in an interview on Bloomberg Television on June 5. "It's a core technology that we view as very important." The prospect of self-driving cars has seen a slew of technology companies push into the auto industry, which is estimated to be worth $6.7 trillion by 2030, according to McKinsey & Co. Alphabet. 's Waymo unit has signed partnerships with Fiat Chrysler Automobiles and Lyft Inc. to develop the technology. And carmakers from BMW Group to General Motors have opened sizable Silicon Valley offices and dedicated hundreds of millions of dollars to acquire autonomous vehicle startups. Apple had initially been seeking to build its own car, before recalibrating those ambitions last year to prioritize the underlying technology for autonomous driving, Bloomberg News reported. The iPhone maker had hired more than 1,000 engineers to work on Project Titan, as the car team is known internally, after it started in 2014. Ballooning costs and headcount led to Apple veteran Bob Mansfield being given the reins of the team in 2016. Cook has never before openly outlined Apple's plans, though public filings have surfaced in recent months that provided snapshots of Apple's efforts. The iPhone maker secured a permit from the California Department of Motor Vehicles in April to test three self-driving SUVs, photos of which emerged several weeks later. A half-dozen vehicles had been surreptitiously testing the autonomous technology on public roads in and around the San Francisco Bay area for at least a year, according to someone familiar with Project Titan. Apple spokesman Tom Neumayr declined to comment on how long the company has been conducting road tests. In December, Steve Kenner, Apple's director of product integrity, penned a letter to the National Highway Traffic Safety Administration revealing the company's interest in automotive technology. It became public when it was published on a federal website. In the letter, Kenner wrote about the company's excitement surrounding the potential for automated systems in fields like transportation. 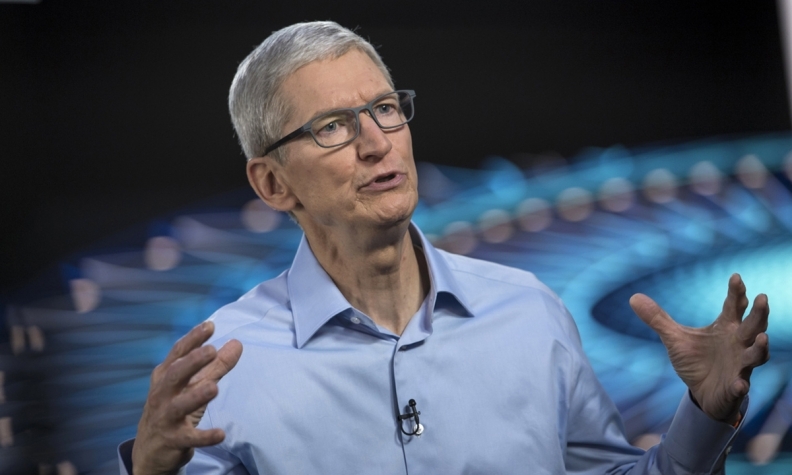 "There is a major disruption looming there," Cook said on Bloomberg Television, citing self-driving technology, electric vehicles and ride-hailing. "You've got kind of three vectors of change happening generally in the same time frame." In the interview on Bloomberg Television, Cook was hesitant to disclose whether Apple will ultimately manufacture its own car. "We'll see where it takes us," Cook said. "We're not really saying from a product point of view what we will do."